I love Dan Lepard’s recipes and when I was looking for some savoury inspiration to feature on the blog, his book Short and Sweet called to me from the book shelf. Well these steak, swede and mustard pasties did, to be more accurate. It is full of so many recipes, along with different flavour suggestions for those recipes alone. 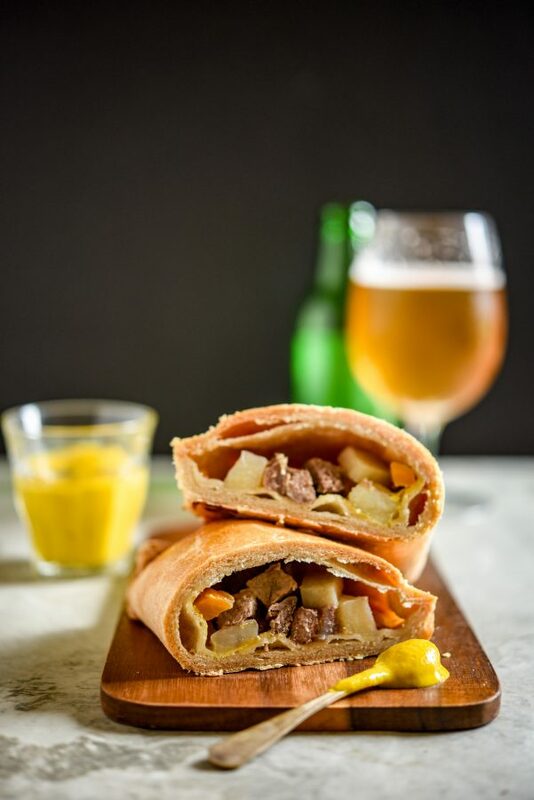 When I saw the steak, swede and mustard pasties I knew I had to make them. I love pasties and when I studied food technology at school, cheese, potato, bacon and onion pasties were the recipe I created for one of my assignments. 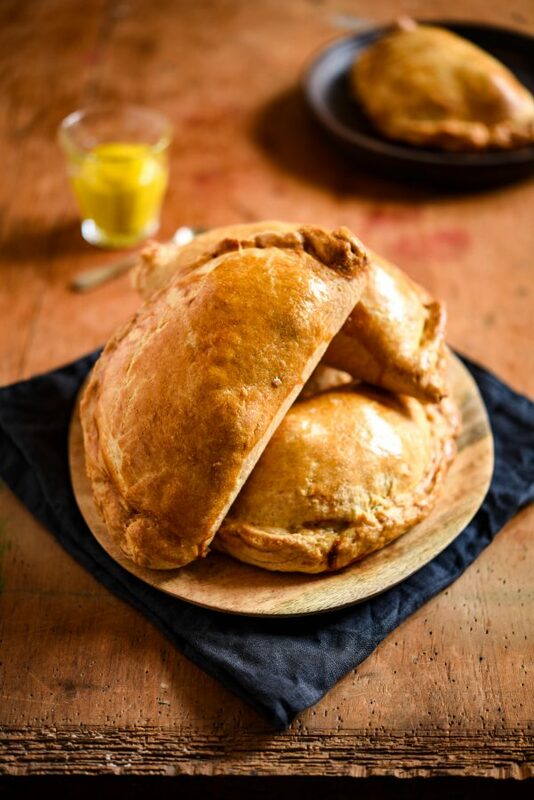 I have such vivid memories of making them and how good they tasted, it seemed only right to feature a pasty recipe on the savoury section of my blog. 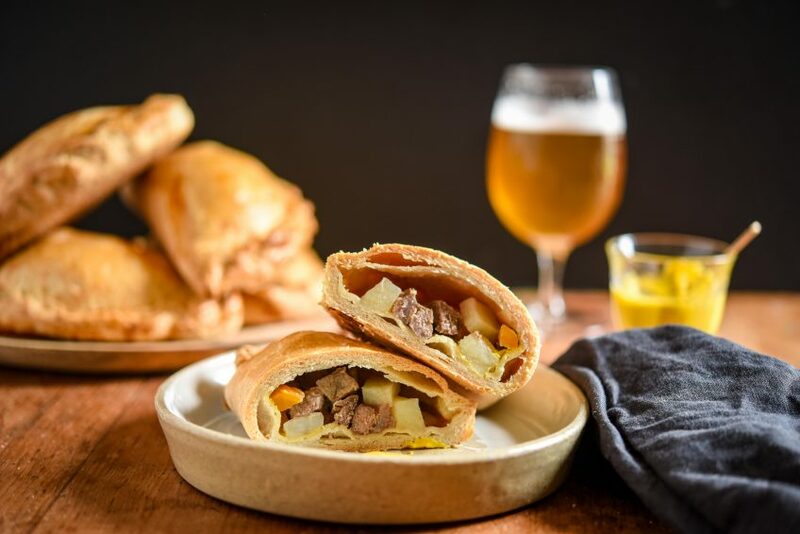 You’ll notice that I haven’t called them Cornish pasties, I am not Cornish, these do not profess to be a Cornish recipe (Dan Lepard is Australian for anyone wondering) so I am not stupid enough to insult the Cornish by calling these Cornish pasties. 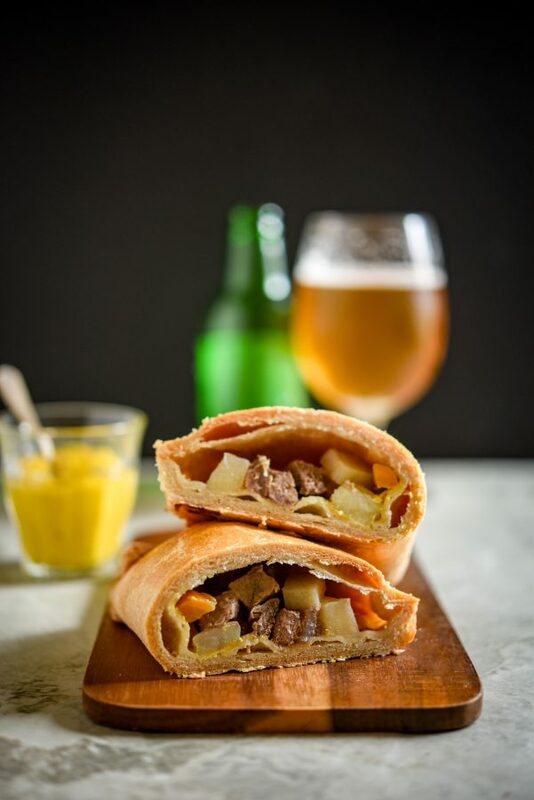 They are delicious steak, swede and mustard pasties that are perfect for lunchboxes, picnics and roadtrips. The pastry is not as light as you might expect from a puff pastry because of the dripping, so be sure to roll the pastry out as thinly as you can manage. The crimped edge can become quite tough otherwise. 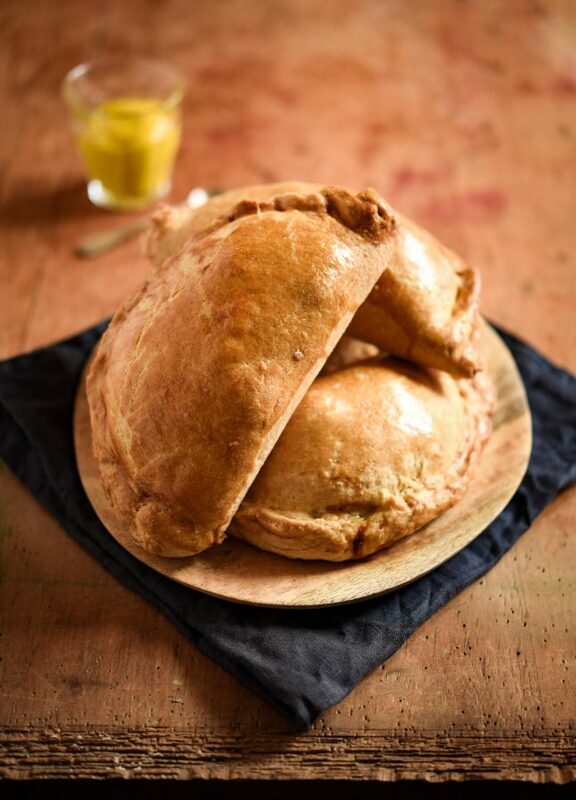 Although, you would be forgiven for leaving the crimped edge, as traditionally this was the handle of the pasty and the Cornish miners left the crimped edge behind because it would get covered in all manner of things from their dirty hands, particularly arsenic when they stopped for lunch. 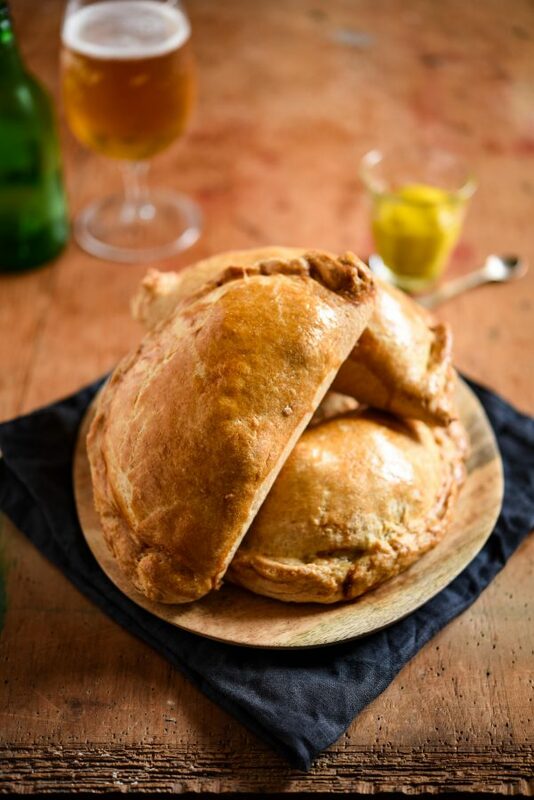 Pasties used to also be made of two halves, one sweet and one savoury. It’s actually an ingenious way of transporting your food before the days of excessive packaging. 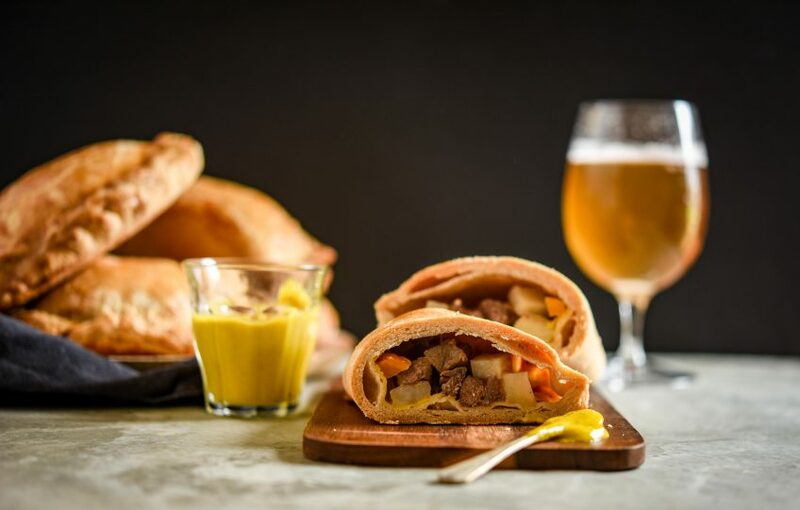 These pasties are very simple to make as you can see from the recipe below and they are very versatile if you wanted to change any of the flavours or experiment at all. Place both types of flour and the salt in a mixing bowl. Cut the butter into small cubes and rub through the flour. Cut the dripping into 1cm cubes and toss these through the flour mixture as well. Beat the water with the yolks to combine, stir this through the flour with a fork until it start to form a dough in the bowl. Add a little more water if needed, then leave the doughy mass in the bowl for 30 minutes. Generously flour the work surface, enough to stop the dough sticking, then place the dough on it and roll out to measure a 50cm by about 20cm rectangle. Fold the dough in to thirds so it looks like a letter with the top folder over the bottom. Roll it out again and do the letter fold again. Cover the dough and leave it somewhere cool to rest for 30 minutes. Repeat the two sets of rolling and folding twice more at 30-minute intervals. At this point, the pastry is ready to be used. It can be frozen, sealed in a zip-lock bag, for a few weeks. Simply allow to thaw completely before using. Make the filling by lightly freezing 250g rump steak and then cut it roughly into 1cm cubes. The freezing makes it easier to cut the rump steak evenly. Place in a bowl, chop the potato and swede into 1cm cubes and combine this with the beef. Add the salt, ground white pepper and plain flour to the bowl and toss this together, place in the fridge to chill. Roll the pastry to about 5mm thick and cut into rounds using a small side plate. Spread the inside of the pastry lightly with English mustard, don't use too much as it will be too strong. Make sure to leave a gap around the edge of the pastry so you can seal it. Lightly brush around the edge of the pastry with water, then place a generous spoonful of filling on one half of the pastry leaving a 5mm border. Fold the pastry over the filling and press to seal. Place the pasties on a tray with a slight lip to catch any oil that runs from the pastry, and chill them while you heat the oven to 200C (180C fan-assisted). Bake for 45 minutes until the pastry is a rich golden colour and the filling hot. Oh the beautiful golden brown pastry and the delicious filling. They look addictive. Thank you Sonali – it’s a delicious recipe the pastry is so easy to make.